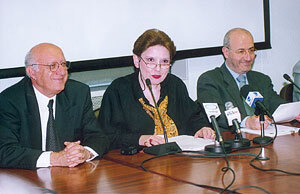 IPJ Director Magda Abu-Fadil delivers opening remarks and introduces LAU President Dr. Riyad Nassar (left) and Lebanese Information Minister Ghazi Aridi. 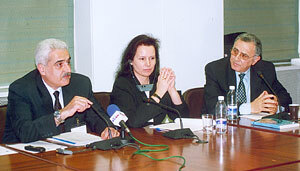 Dr. Riyad Nassar, Magda Abu-Fadil and Marcello Scarone from UNESCO listen to "the official view" delivered by HE Ghazi Aridi during the opening session. Octavia Nasr (CNN), Mona Ziade (The Daily Star) and Mohammad Baalbaki (Lebanese Press Order) discuss the use of sources in journalism. 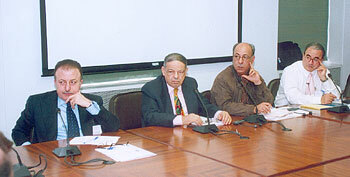 Jawad Adra (Information International), Melhem Karam (Lebanese Journalists Association) and Faysal Salman (As-Safir) discuss gifts, junkets and benefits in a session chaired by Ramez Maluf (LAU). 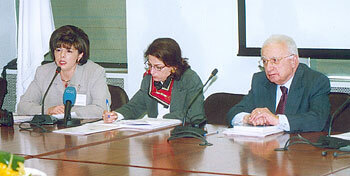 Ghayath Yazbeck (MTV), Stephania Delfino Bork (International Federation of Journalists) and Nabil Dajani (American University of Beirut) during a session on accuracy and fairness. Edmond Saab (An Nahar), Sarah Sullivan (American University in Cairo) and Stephen Quinn (Zayed University) gave their views on journalists' freedom. 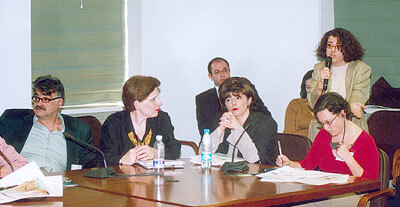 The roundtable provided a platform for participants to raise issues of concern to professional journalists in Lebanon.